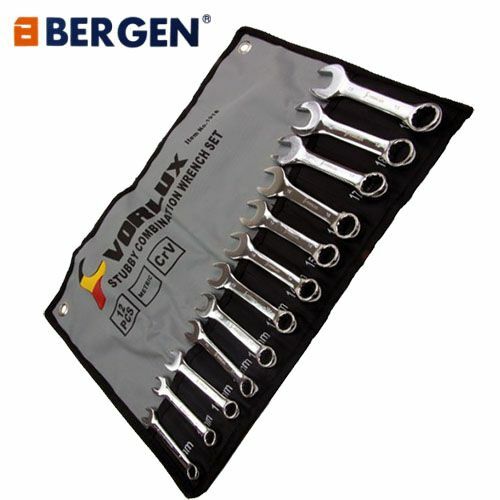 A professional set of 12pc Metric Combination Stubby Wrench Spanners from Vorlux / Bergen Tools. 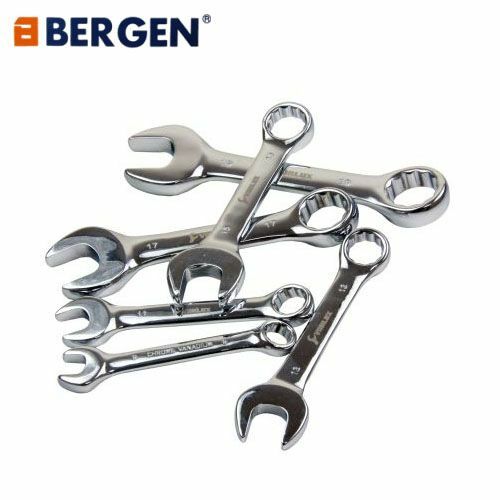 Each spanner is professionally manufactured from Chrome Vanadium and has a polished mirror finish, thus allowing ease of cleaning after use and prolonging the life in service of these spanners. The spanners, as can be seen in the pictures, comes complete with a reinforced plastic type/canvas roll to allow the easy identification of each spanner and allowing them to be placed back in the roll after use using the mm identification numbers on each individual pouch. The roll also has two strong metal grommets on the top corners allowing for easy hanging in the workshop or shed. Superb quality from Vorlux by Bergen Tools.